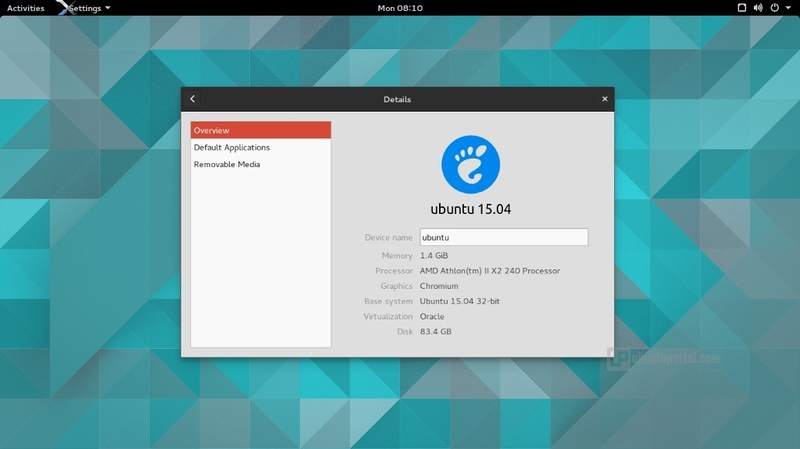 Ubuntu GNOME 15.04 is an official ubuntu flavors based on ubuntu 15.04, released and announced by Ubuntu Gnome Team with the latest version of GNOME 3.14. This release is supported with security patches and software updates for only 9 months, until February 2016. Ubuntu GNOME 15.04 include Linux kernel 3.19 and uses systemD as default boot manager replaced upstart. gnome-maps and gnome-weather are now installed by default. Also the GNOME Classic session is also included by default. Gnome Tweak tool will allow users change advanced GNOME options also included by default. Adwaita, the official GNOME theme include by default. Including for the wallpaper. For those who still prefer something more colorful, Numix Humanity theme and icons are also pre-installed. pre-installed applications that included in Ubuntu GNOME 15.04, we can mention nautilus file manager, Mozilla Firefox 37.0 web browser, LibreOffce Suite 4.4, Emphaty 3.12 IM client, Rhythmbox 3.1 music manager, Shotwell 0.20.2 photo manager, Gedit text editor, Ubuntu Software Center, etc. Ubuntu GNOME 15.04 available in 64-bit and 32-bit architecture. The both can downloaded from link below.